Well we are 8 months into the project now and you are definitely overdue an update! It’s been a really busy winter, I’ve had 8 volunteer work parties and numerous trips to the project area to deliver Barberry plants. Many of the plants have been delivered in small numbers to residents or landowners who wish to take between 3 and 15 plants and this doesn’t often warrant advertising for volunteer help. 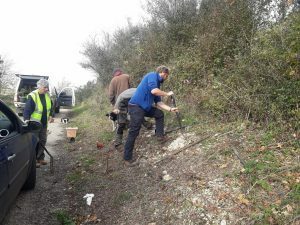 Therefore, although planting with volunteers on 8 tasks doesn’t sound all that much, I’m happy to say that we will have planted in around 40 locations this winter and the end result will be that there will be about 770 new Barberry plants around the Dorset, Wiltshire and Gloucestershire colonies by mid-March. One of the most successful ways of finding new planting locations has been putting articles into parish newsletters and encouraging interested residents to get in touch. Many of them have then contacted their friends and neighbours and word of mouth has been really important. 770 new Barberry plants around the colony areas will provide vital stepping stones for the moth between isolated colonies and as long as they are looked after and grow well, that is a lot more food-plant for the future. One of the main reasons for the rarity of the Barberry Carpet Moth is that Barberry is known to be an intermediary host for a potentially damaging stem rust that affects some cereal crops, primarily wheat and barley. Therefore, since the 19th century, much Barberry has been removed from the general countryside in Britain and the plant itself is now quite restricted. We haven’t had an outbreak of stem rust in the UK since 1955. We were contacted by crop scientists at the John Innes Centre (JIC) at the end of summer 2017, as they have been conducting some research on the potential future threat of stem rust re-emergence in the UK in relation to a host of factors that include climate change, resistance in wheat, and the alternate host of Barberry. There have been some outbreaks of rust in Europe in recent years and there was one infected plant found in Suffolk in 2013, but so far nothing more. Our discussions with the JIC have caused us to revise our planting plans slightly and plant further away from cereal crops than we originally were. This will ensure that our new plantings won’t ever be a problem for arable crops, whether or not we ever get another outbreak of rust here. The JIC recently published their research and you can read their press release here. The farming press gave accurate accounts of the situation but unfortunately a couple of national newspapers ran inaccurate stories with sensationalist headlines. While this may sell papers, it doesn’t help shed light on a complex subject. We are keen to give an accurate account of the situation and any potential risks and are hopeful that anyone who has Barberry on their land, or is considering planting it, and is concerned after reading these articles will get in touch with us directly. By working with the national experts on cereal stem rust, we can pass on the latest information and be a part of continuing studies to ensure the risks of the disease re-emerging are minimised. “The spores that then form on barberry only travel a short distance and so for barberry plants to enable sexual reproduction they must be planted in very close proximity to a cereal crop, likely within 20 metres. Therefore, by making a collaborative effort to ensure that bushes are planted at least 20 metres away from susceptible crops we can both continue to provide the vital habitat for the Carpet Moth whilst likely avoiding any future potential issues regarding stem rust”. Meanwhile the Barberry Carpet Moths are quietly pupating in the soil near the Barberry plants, completely unaware of all these developments and the unfortunate reputation of their only food source. Let’s hope they have a good season and we continue to find lots of supportive residents and landowners with suitable gardens and land away from arable crops. Carefully planned conservation action informed by scientific evidence is at the heart of Back from the Brink. Through crop scientists and conservationists working together, we are confident that we can ensure that arable farming, Common Barberry and the Barberry Carpet Moth can continue to co-exist quite harmoniously.